Dinosaur Eggs Discovered! : Unscrambling the Clues, by Lowell Dingus, Luis M. Chaippe, and Rodolfo Coria. Twenty-First Century Books, 2007. This slim book is a sequel to Chiappe and Dingus’s Walking on Eggs (an SB&F Best Book of 2001 selection for junior high and high schools), except that the authors’ seniority is reversed and a third coauthor is added. 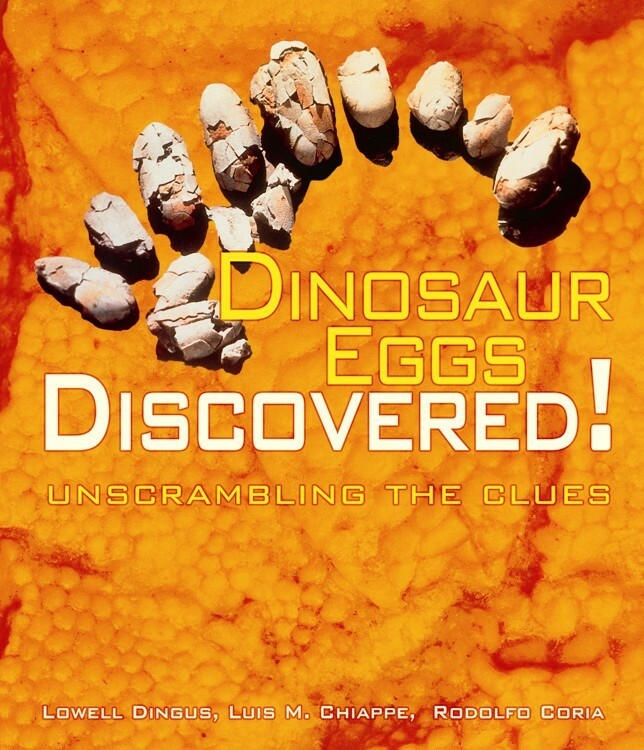 The book summarizes 1997 and 1999 paleontologic expeditions to a spectacular fossil-collecting site in Patagonia where the authors discovered hundreds of eggs laid by 40-foot-long titanosaur dinosaurs on a floodplain of Late Cretaceous age. Some of the eggs contained embryos, and many were found in clutches within nests excavated by the huge sauropods. The exciting find of a skeleton of a probable predator of the titanosaurs is also described. An innovative format posing the reasoning followed in answering nine questions about the site, its former environment, and its former inhabitants provides an introduction to scientific methodology for younger readers. An especially thought-provoking question discusses the shaky scientific premises and methods used in re-creating living dinosaurs in the movie Jurassic Park. Color photographs taken in the field and excellent color reconstructions further enhance the book. Of special interest are feature boxes on a yellow background that amplify topics mentioned in the text. Among the topics discussed in these boxes are radioactive dating, dinosaur classification, and plate tectonics. A helpful glossary, a list of suggested further readings, the URLs of supportive websites, and a useful index are included. Dr. Lowell Dingus, Dr. Luis M. Chiappe, and Dr. Rodolfo Coria led the expedition that discovered the dinosaur nesting ground in Argentina. Dr. Dingus, a research associate at the American Museum of Natural History and the Natural History Museum of Los Angeles, was the head geologist on the team. Dr. Chiappe, who is chairman of the Department of Vertebrate Paleontology at the Natural History Museum of Los Angeles County, researches fossil vertebrates and is an expert on the evolution of early birds. Dr. Coria is director of the Carmen Funes Museum in Plaza Huincul, Argentina. He has studied the largest dinosaurs discovered—Giganotosaurus and Argentinosaurus. Dingus and Chiappe, aided by Coria, became curators of a multi-city traveling exhibition called The Tiniest Giants. The exhibition was presented by the Natural History Museum of Los Angeles County and the Carmen Funes Museum of Argentina.